Ralf Seppelt and his co-authors from the Helmholtz Centre for Environmental Research in Leipzig (Germany) recently published an interesting inquiry into how ecosystem service research is actually conducted (pdf available here). They draw conclusions on how it should be done. 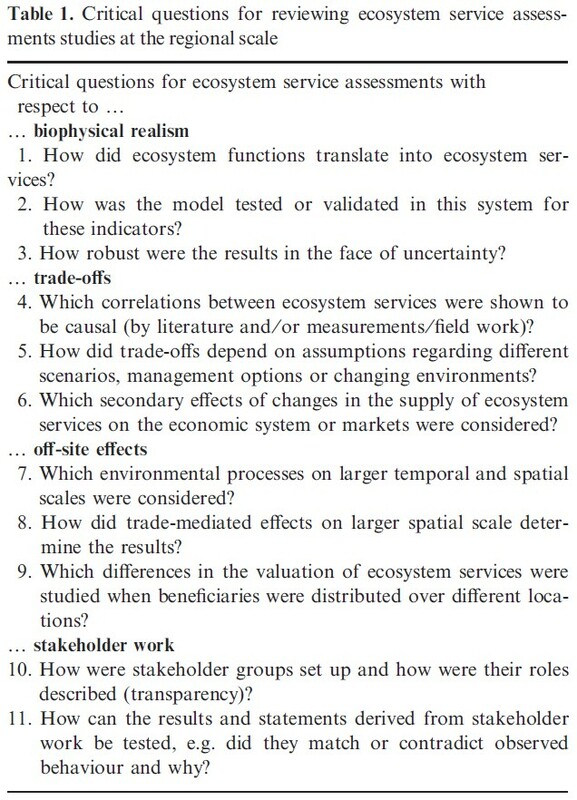 They list key criteria on which to assess whether a particular ecosystem service study actually follows their suggested guidelines. Table 1 below is taken from their paper. The authors mention biophysical realism as a necessary criteria for ecosystem services studies to provide a sound basis for decision making. It could be argued that the same could apply to “socio-political” or “socio-economic” realism. Stakeholder involvement does not necessarily guarantee such realism, especially when stakeholders have very heterogeneous needs and preferences and/or where there are important power asymmetries between stakeholders.